Many Australians did not receive fair, accurate and impartial reporting in the public interest in relation to the carbon policy in 2011. 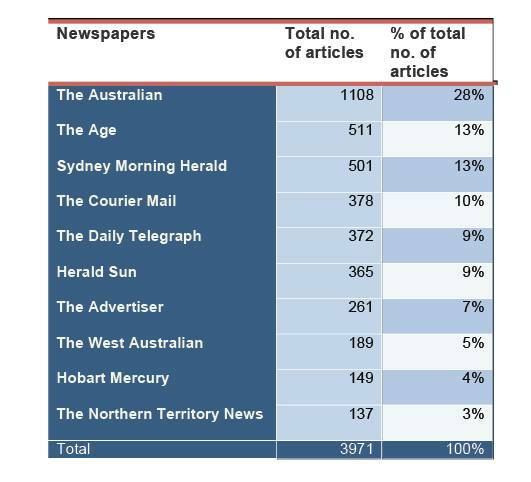 An estimated 25% of Australians read one of the ten capital city newspapers (omitting the Canberra Times). Between February and July last year, these ten papers printed almost 4,000 articles on climate change policy, a whopping 28% in The Australian alone. Most were on the Gillard Government’s carbon price policy. Of the total, 43% were negative, 41% neutral and 15% positive. News Limited publications comprised 65% of the total. For the News reader, the respective numbers were 50%, 41% and 10%. That’s right, less than 10% of the 2,770 articles on climate policy in the major News Limited papers during this period were positive towards climate policy. The deniers did not decide that climate change is a left-wing conspiracy by uncovering some covert socialist plot. They arrived at this analysis by taking a hard look at what it would take to lower global emissions as drastically and as rapidly as climate science demands. They have concluded that this can be done only by radically reordering our economic and political systems in ways antithetical to their “free market” belief system. Late last year Andrew Revkin of the New York Times blog DotEarth got in touch with a few people to ask their view of Australia’s carbon legislation. He followed up with a question asking whether the legislation was any good if Australia’s large coal exports weren’t included. Can the US and Australia slake China’s coal thirst and still claim CO2 progress? He got views both pro and con. I ended up writing a post that was glass half empty – glass half full. One of the most vocal critics of the domestic policy was Guy Pearse, author of Quarry Vision and High and Dry, an essay and book about the relationship between Australia’s mining industry, politics, and climate policy. I was interested in how much CO2 Australia was likely to export, but had come up high and dry. So I asked Guy what the numbers were. Coincidently he was putting together estimates for current and future projects for a talk at the Woodford Folk Festival, so I offered to have a look at the temperature and CO2 budget effects. Guy’s estimate is that Australia will export about 75 Gigatonnes CO2 conservatively between now and 2050. That’s 10% of the total budget estimated by the German agency WBGU (pdf) that can be emitted from 2008 to give a 2 in 3 chance of avoiding 2°C. First week of December I was at the American Geophysical Union Fall Meeting in San Francisco. This meeting is big: an estimated 20,000 attendees this year dealing with all matters geophysical from global change to stressed rocks. I had a poster to give, and being super organised, spent the first two days of the meeting preparing it. The AGU’s 24 hour poster print service got me a big 6’ x 4’ poster by the Thursday session. And it was a complicated poster, let me say, though there were simple bits in it. When you want to overturn a paradigm, a simple “it ain’t so because it ain’t” doesn’t cut it. The main thesis is that the signal-to-noise model, which assumes a smooth anthropogenic change signal within a background of noisy natural variability, is wrong. Instead the climate follows a deterministic non-periodic pathway, to coin Ed Lorenz of butterfly complexity, where the forcing produced by increasing greenhouse gases does not gradually change climate, but comes in steps. The bulk of the energy is stored in the ocean, with climate showing little warming, only to be released in periodic bursts influenced by the processes associated with climate variability. This blog serves a couple of purposes. One is to get some of my thoughts into written form, another is to practise communicating complex issues simply (Ha – don’t always often succeed on that one!). Yet another is to use the research behind posts to expand my knowledge of particular issues. Many of last year’s posts are too complicated and detailed – often because I’m exploring the edges of what’s known – but in future I’ll try to balance these out with simpler summaries. There will continue to be gaps where I get too busy to post, but hopefully the regularity of posts will increase. I’m interested to hear of issues that readers and lurkers have which they would like expanded upon. Is 2012 the last year? One of the running topics in the media this year is that it is the year of a b’ak’tun, the end of a Long Count Mayan Calendar. Some writers have linked the b’ak’tun with the apocalypse; the Mayans say that has no basis. But we love a good disaster, don’t we? Wikipedia has along post on the eschatology of 2012, showing that links to end of the world come from a variety of (mainly New Age) sources. Go read – it’s interesting and entertaining. The end is nigh! In addition to the end of the world, other themes I follow will seek the transformation of the existing world and the path it is on into an imagined future. One that our descendants can look back from and say “They did good”. What might that world look like, how will our current values translate into the future, and how do we get there? How the climate changes – hopefully putting the signal-to-noise model of climate change in it’s place. The world ain’t linear. Some insights from research behind the IPCC chapter Foundations of Decision-making that I am currently working on (without divulging its contents). It’s a fascinating pot-pourri of different disciplines seeking a solid narrative. Bulletins from the climate science-policy interface. Exposing misinformation, misdirection and agnotogeny (the generation of ignorance) designed to divert our attention from risks in social-ecological systems. Using scenarios to imagine the future. Turning the problem-based scientific scenario into a solution-based creative scenario. Wicked problems – with even wickeder solutions! I kind of like the symbolism behind the b’ak’tun. The end of a long count, a celebration, the start of a new one. Let’s make this year a good one.